Tourism in Israel is one of Israel's major sources of income, with a record 3.6 million tourist arrivals in 2017, and 25 percent growth since 2016 and contributed NIS 20 billion to the Israeli economy making it an all-time record. Israel offers a plethora of historical and religious sites, beach resorts, archaeological tourism, heritage tourism and ecotourism. Israel has the highest number of museums per capita in the world. In 2009, the two most visited sites were the Western Wall and the grave of Rabbi Shimon bar Yochai; the most popular paid tourist attraction is Masada. 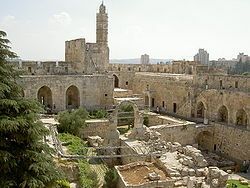 The most visited city is Jerusalem and the most visited site was the Western Wall. The largest percentage of tourists come from the United States accounting for 19% of all tourists, followed by Russia, France, Germany, the United Kingdom, China, Italy, Poland, and Canada. Jerusalem is the most-visited city with 3.5 million tourist arrivals annually. 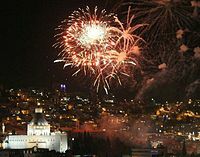 One of the oldest cities in the world, it is the proclaimed capital[Note 1] and largest city of Israel, if the area and population of East Jerusalem are included. It is a holy city to the three major Abrahamic religions – Judaism, Christianity, and Islam – and hosts many historical, archaeological, religious and other attractions. The German Colony, a Temple Society settlement, with a colorful mix of architectural styles. Yad Vashem Holocaust memorial museum. Ein Karem, the traditional birthplace of John the Baptist, is one of the four most-visited Christian pilgrimage sites in Israel. Mt. Zion, the traditional resting place of King David. Mt. Scopus, site of the Hebrew University and standing at 2710 feet or 826 meters above sea level, offers a panoramic view of the city. Both the Temple Mount and the Dead Sea are visible from this location. The Old City of Jerusalem, traditionally divided into four quarters: the Armenian Quarter, Christian Quarter, Muslim Quarter and Jewish Quarter. Most importantly, the Temple Mount (known in Arabic as Haram ash-sharīf, the Noble Sanctuary), site of the ancient Temple in Jerusalem with only the Western Wall at its foot remaining, and now with the Dome of the Rock and Al-Aqsa Mosque. The Mount of Olives and Kidron Valley: with its lookout point, Tomb of Absalom, and other Jewish tombs and burial grounds dating back 3000 years[discuss], and churches, Gethsemane, church of all nations, Dominus Flevit, and the Church of Maria Magdalene (Russian orthodox church). Various locations have been proposed as the Tomb of Jesus, traditionally identified as where the Church of the Holy Sepulchre stands. Nor has Golgotha, the nearby hill where he was crucified been located. Immediately south of the Jewish Quarter lies the City of David with archaeological digs including the Siloam Tunnel. The controversial status of East Jerusalem has been an issue when attempting to market Jerusalem to international tourists. In 2009, 2010, and again in 2015, the UK Advertising Standards Authority ruled against a series of Israeli Ministry of Tourism advertising campaigns that displayed images and information about tourist sites located in East Jerusalem. The Authority wrote in its ruling that "the status of the occupied territory of the West Bank was the subject of much international dispute, and because we considered that the ad implied that the part of East Jerusalem featured in the image was part of the state of Israel, we concluded that the ad was likely to mislead." Israel rejected the ruling, with the Ministry of Tourism releasing a statement that said the ad provided "basic, accurate information to a prospective UK visitor". The ruling from 2009 also included criticism about Gaza, the West Bank and the Golan Heights being shown as part of Israel. With 2.3 million tourist visits in 2013, Tel Aviv is Israel's second-largest city, and a cosmopolitan, cultural and financial global city. The city's greater area is the largest with 3 million inhabitants. Tel Aviv exhibits a UNESCO world heritage area of Bauhaus architecture. The nearby historical city of Jaffa is experiencing a touristic boom. In 2010, National Geographic ranked Tel Aviv as one of the world's ten best beach cities. 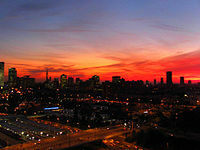 Tel Aviv is called the "city that never sleeps" by the locals because of its vibrant nightlife scene. Tel Aviv was named "the gay capital of the Middle East" by the Out magazine. Safed is one of the four holy cities in Judaism, where much of the Jerusalem Talmud was written and kabbalah (Jewish mysticism) was developed. Famous for its artisans. The grave of Rabbi Shimon bar Yochai is in nearby Meron. 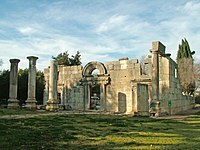 Around the city, there are many nature reserves and archaeological sites notably the ancient synagogues. (Bahá'í) Shrine of Bahá'u'lláh, resting place of Bahá'u'lláh as well as a Unesco world heritage historical town. (Bahá'í) Shrine of the Báb, its terraces, and the Bahá'í World Centre and the buildings (a Unesco world heritage). Tiberias is one of the four holy cities in Judaism, overlooking the Sea of Galilee. Saint Peter's house at Capernaum, Tabgha and the Mount of Beatitudes. Nazareth is known as the 'Arab capital of Israel'. Jesus's hometown and the site of many of his reported acts and miracles. Many churches, including The Church of the Annunciation, the largest church building in the Middle East. In Roman Catholic tradition, it marks the site where the Archangel Gabriel announced the future birth of Jesus to the Virgin Mary (Luke 1:26–31). Starting point for the Jesus Trail, a network of hiking routes connecting many sites from Jesus's life and ministry. Settlement of Beersheba attributed to the patriarch Abraham. Regional capital of the Negev desert. It serves as a starting point for exploring such sites as the Ramon Crater or the UNESCO world heritage Nabataean Incense Route (Shivta, Avdat, Mamshit). Eilat, Israel's southernmost city, located on the Red Sea coast, is a hot, sunny year-round travel destination. Popular destination for skin and scuba diving, with equipment for hire on or near all major beaches, the Eilat Mountains are similar to those in Sinai and there are trail roads for hiking, you can also find animals like dorcas gazelle, rock hyrax, striped hyena and Nubian ibex. 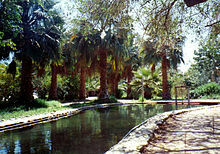 Eilat has big hotels and various attractions such as camel riding, and the Eilat's Underwater Observatory Marine Park. Ashkelon is a city between Gaza City in the Gaza Strip and Ashdod, the city offers many some hotels and Mizrahi Jewish restaurants, there is also a local Arak drink called Arak Ashkelon, pretty famous around Israel. Tel Ashkelon is a big archaeological site, includes ruins from many different periods such as Canaanites, Philistines, Persians, Phoenicians, Greeks, Romans, Byzantines, Muslims and Crusaders. Ashkelon has no active pilgrimage site but it was one of the places where the head of Husayn ibn Ali before transferred to Cairo, the mosque was destroyed in 1950 but in 2001 a small compound built on the site for Shia Islam pilgrims from India who visiting the site, there is also a well believed by Muslims and Christians alike which is one of Abraham's wells. The sand dunes between Ashkelon to Ashdod and between Ashkelon to the Gaza Strip are popular attractions on this area of the sea coast. Masada is an ancient fortification in the Southern District of Israel situated on top of an isolated rock plateau (akin to a mesa) on the eastern edge of the Judaean Desert, overlooking the Dead Sea. Herod the Great built palaces for himself on the mountain and fortified Masada between 37 and 31 BCE. According to Josephus, the Siege of Masada by troops of the Roman Empire towards the end of the First Jewish–Roman War ended in the mass suicide of the 960 Jewish rebels and their families hiding there. 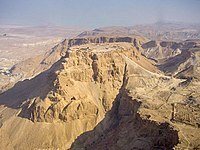 Masada is located 20 kilometres (12 mi) east of Arad. Masada is a UNESCO World Heritage Site and Israel's most popular tourist attraction only second to Jerusalem. Caesarea's ancient city includes Roman and Crusader ruins, such as the amphitheater and hippodrome, where live concerts of classical and popular music are frequently held, as well as the harbor from which St. Paul was taken as a prisoner to Rome. 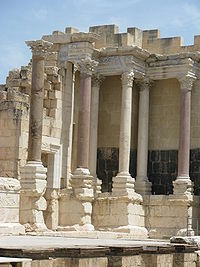 It is one of Israel's biggest archaeological sites. Beit She'an (Scythopolis) was a Roman Decapolis city. One of the largest archaeological sites in the Middle East. Beit She'arim National Park was an ancient Jewish Necropolis, it is having many tombs of Jews with many significant signs like animals and menorah, it is also includes a Jewish city and an ancient synagogue ruins. 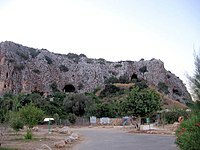 Sites of human evolution at Mount Carmel – Nahal Me'arot Nature Reserve is a site of human evolution at Mount Carmel in Haifa, Northern Israel. It has four caves such as Me’arat HaTanur (the Oven Cave; also known as Tabun Cave), Me’arat HaGamal (the Camel Cave), Me’arat HaNahal (the Stream Cave) and Me’arat HaGedi (the Young Goat Cave). The site was proclaimed as universal value by UNESCO in 2012.The site indicates the prehistoric man's settlements and unique evidence of a first burial. Incense Route – Desert Cities in the Negev – The Negev incense route located between Jordan's Petra and Palestine's Gaza, the Nabataeans have built many fortresses, caravanserai but especially known for their four important cities of Avdat, Mamshit, Shivta, and Haluza that located on this important trade route, the Negev Incense Route is a UNESCO World Heritage Site. Israel as the birthplace of Judaism and cradle of Jewish history includes many ancient synagogues from the Second Temple Period and Byzantine-Muslim periods from Northern to Southern Israel. the synagogues are: Capernaum, Magdala, Masada, Anim, Susya, Bar'am, Gush Halav, Beit Alpha, Hukok, Nabratein, Ein Gedi, Herodium, Gamla, Umm el Kanatir, Caesarea, Hamat Tiberias and many more. Har Karkom ("Mountain of Saffron", also called Jabal Ideid) is a mountain in the southwest Negev desert in Israel, halfway between Petra and Kadesh Barnea. On the basis that the Israelites travelled across the Sinai peninsula towards Petra in a fairly straight line, a number of scholars have contemplated the possibility of Har Karkom being the Biblical Mount Sinai. Following this theory, Emmanuel Anati excavated at the mountain, and discovered that it was a major paleolithic cult centre, with the surrounding plateau covered with shrines, altars, stone circles, stone pillars, and over 40,000 rock engravings. Beit Guvrin-Maresha National Park is a national park in central Israel, 13 kilometers from Kiryat Gat, encompassing the ruins of Maresha, one of the important towns of Judah during the time of the First Temple, and Beit Guvrin, an important town in the Roman era, when it was known as Eleutheropolis. There are many Muslim saints which are buried in the area, the most known of them is Prophet Muhammad's companion Tamim al-Dari In 2014 UNESCO has recognized it as a World Heritage Site. Israel includes many ruins of Crusader fortresses, the most known of them are Acre, Caesarea, Belvoir Fortress, Montfort Castle, Arsuf, Atlit fortress, Sepphoris, Chateau du roi and more. 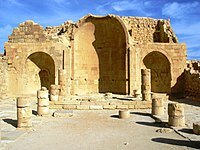 Arsuf also includes the nearby Sidna Ali Mosque which is still in use, the mosque includes a tomb of relative of Caliph Omar who died at the Battle of Arsuf. Sea of Galilee is home to many Christian and Jewish holy shrines, the Jewish holy shrines are in Tiberias (click for taking a look of the sites), and the Christian sites are outside Tiberias, some of them are archaeological sites, the sites are – Magdala, Capernaum, Tabgha and the Mount of Beatitudes, there are also another archaeological sites such as Kursi, Hippos, Hamat Tiberias, Tel Bet Yerah, Khirbat al-Minya and Chorazin. it is also have a collection of fauna and flora. Mount Arbel lies near the Sea of Galilee and is a national park with a fortress and synagogue and cliff hikinh. The fortress was built by Jewish zealots and then in the Ottoman era by Fakhreddine II on the cliffs of the mountains, the ancient synagogue was built in the 5th century and survived little bit after the Islamic period started. The nearby area is the site of Horns of Hattin famous for his Islamic victory of Saladin at the Battle of Hattin and nearby this is the shrine of prophet shuaib, Maqam al-Nabi Shu'ayb is the holiest shrine for Druze faith; the Druze are making a big Ziyarat every year in April. The Rosh HaNikra grottoes are cavernous tunnels formed by sea action on the soft chalk rock. The total length is some 200 metres. They branch off in various directions with some interconnecting segments. In the past, the only access to them was from the sea and experienced divers were the only ones capable of visiting. Today a cable car takes visitors down to see the grottos. A kibbutz, also named Rosh HaNikra, is located nearby. The Israeli city Nahariya is located about 10 km (6 miles) south of Rosh HaNikra. you must take a cable car to get into the grottoes. The Cable car is situated very close to the Lebanese border. A Makhtesh is a geological landform considered unique to the Negev desert of Israel. A makhtesh has steep walls of resistant rock surrounding a deep closed valley which is usually drained by a single wadi. The valleys have limited vegetation and soil, containing a variety of different colored rocks and diverse fauna and flora. The best known and largest makhtesh is Makhtesh Ramon. Other makhteshim are Makhtesh Gadol, Makhtesh Katan and Mount Arif two small Makhteshim the Makhtesh is also a rare geological area. Sepphoris was an ancient Jewish village with synagogue, houses, baths, water tunnels, crusader fortress and more. it was also one of the site of the house of Anne and Joachim. Nimrod Fortress is a big Ayyubid castle, a good example for Ayyubid fortresses from the time of the Crusader wars. Hula Lake Park, known in Hebrew as Agamon HaHula, is located in the southern part of the Hula Valley, north of the nature reserve. It was established as part of a JNF rehabilitation project. In the early 1990s part of the valley was flooded again in the wake of heavy rains. It was decided to develop the surrounding area and leave the flooded area intact. The new site has become the second home for thousands of migrating birds in the autumn and spring. The lake covers an area of one square kilometer, interspersed with islands that serve as protected bird nesting sites. It has become a major stopover for migrating birds flying from Europe to Africa and back, and also a major birdwatching site. In 2011, Israeli ornithologists confirmed that Lake Hula is the stopover point for tens of thousands of cranes migrating from Finland to Ethiopia every winter. In Israel, farmers set out food for them to keep them from damaging crops near the lake. A big natural arch in Israel's Upper Galilee, which was a cave that was destroyed due to geological reasons over the years. Today only the arch remains and is a popular attraction for professional hiking. Israel is among the world's leading destinations for birdwatching, with birders and ornithologists heading especially for the annual migrations that funnel through Eilat and the Hula Valley. Israel has 67 national parks and 190 nature reserves. Some of them are located at archaeological sites. 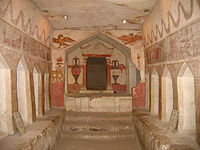 Beit Guvrin-Maresha is a large archaeological complex in the Judean Mountains. Sepphoris is an ancient Roman town with elaborate mosaics and a historic synagogue. 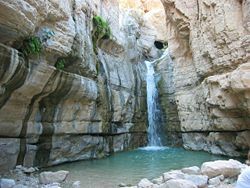 Ein Gedi, a desert spring, is a starting point for tours to Masada and the Dead Sea. Israel National Trail – a hiking path that crosses the entire country of Israel. Its northern end is at Dan, near the international Syrian and Lebanese borders in the far north of the country, and it extends to Eilat at the southernmost tip of Israel on the Red Sea, a length of approximately 940 km (580 mi). The trail takes about 30–70 days to finish if hiked continuously. Jerusalem Trail – 40 kilometres (25 mi) trail, connects the Israel National Trail with Jerusalem and the area of the Old City. Jesus Trail – a 65 kilometres (40 mi) hiking and pilgrimage route in the Galilee region of Israel that traces routes Jesus may have walked, connecting many sites from his life and ministry. The trail begins in Nazareth, and passes through Sepphoris, Cana (Kafr Kanna), the Horns of Hattin, Mount Arbel Cliffs, the Sea of Galilee, Capernaum, Tabgha, the Mount of Beatitudes, Tiberias, the Jordan River, Mount Tabor, and Mount Precipice. Golan Trail – a 125 kilometres (78 mi) route from the slopes of Mt. Hermon to the southern Golan Heights. It passes many towns and settlements including Majdal Shams, Nimrod, Masade, Buq'ata, Odem, Merom Golan, and Ein Zivan. Valley of Springs Trail – a 120 kilometres (75 mi) route in and around the Jordan Valley, terminating in Beit She'an and on Mount Gilboa near Kibbutz Meirav. The trail connects numerous springs (for which the area is famous) and other historical and natural attractions. Sea to sea trail – an 89 kilometres (55 mi) hiking trail in Northern Israel that goes from the Mediterranean Sea to the Sea of Galilee. A network of kibbutzim dot the countryside, some offering guesthouses and country lodging. They are undergoing a process of modernization and re-organization. Well known in Israel for great contributions to Israeli history, politics, the army, and Zionism. Long-term visitors, both Jewish and non-Jewish, can volunteer on Kibbutzim in exchange for food and lodging. With over 200 museums, Israel has the highest number of museums per capita in the world, with millions of visitors annually. Israel Museum in Jerusalem, Israel's national museum, attracts 800,000 visitors a year. As part of its hospitality industry, including hotels, restaurants and wineries, one of the most vibrant restaurant cultures in the Mediterranean region has developed in Israel since the 1990s, catering to both tourists and citizens. Professional training for Israeli chefs, hotel owners, sommeliers and vintners is of a high standard, and top hotel chefs have international education and experience. There are thousands of restaurants, casual eateries, cafés and bars in Israel, offering a wide range of choices in food and culinary styles. In addition to Middle Eastern specialties, there are restaurants offering a wide selection of ethnic food, including Italian, French, Greek, Russian, Ethiopian, Balkan, Thai, Chinese, American and fusion cuisine. Places to eat out that are typically Israeli include falafel stands or kiosks, which also offer extras like French fries, fried eggplant, salads and pickles with the falafel, and the hummusia, which specializes in hummus, and offers only a limited selection of extras. The Misada Mizrahit (literally, "Eastern restaurant") is an inexpensively priced restaurant that serves a basic selection of meze salads followed by grilled meat with French fries, fried kibbeh and simple desserts, while Steakiyot are restaurants which serve a meze of salads, followed by skewered grilled meats, particularly meorav yerushalmi and kebabs or sometimes by kibbeh stew like kibbeh in okra and tomato stew, beet stew. Cafés are common in urban areas and function as meeting places both for socializing and conducting business. They commonly serve coffee, tea, fruit juice and soft drinks and almost all serve baked goods and sandwiches; many also serve light meals. Most have outdoor seating to take advantage of Israel's temperate weather, and Tel Aviv is particularly well known for its café culture. Tea is also served in cafés, from plain brewed Russian-style with sugar, to tea with lemon or milk, and Middle Eastern-style with mint (nana). There is also a strong coffee drinking culture in Israel and coffee is prepared in many ways, such as instant (nes), iced, latte (hafuḥ), Italian-style espresso, or Turkish coffee. Enotourism is a growing part of the tourism sector in Israel. In early 2008, it was announced that a 150-acre (0.61 km2) wine park would be created on the slopes between Zichron Ya'akov and Binyamina in order to promote tourism in the area and enotourism in Israel in general. West Bank tourism has been controlled by Israel since the territory was occupied in 1967. Territory that had been off-limits to Israeli citizens was now made available for tourism, and Israel established numerous amenities in these territories and East Jerusalem to make it more appealing to Israeli and foreign tourists. Despite that, Israeli citizens are generally restricted from traveling to parts of the West Bank under Palestinian Authority control. Today, The Palestinian Authority and Israeli tourism ministries work together on tourism in the Palestinian territories in a Joint Committee on Tourism. Bethlehem - Burial place of the matriarch Rachel and birthplace of King David and of Jesus. Around 1.3 million tourists visited the city in 2008. Popular sites in the city and around include: The Church of the Nativity, a church built over the cave that tradition marks as the birthplace of Jesus of Nazareth; The Manger Square; Shepherd's Field in Beit Sahour; Solomon's Pools; and the Salesian Cremisan Monastery. Herodium - A fortress built by Herod the Great. It is administered by the Israel Nature and Parks Authority. Hebron – The second-holiest city in Judaism and the place where the Tomb of the Patriarchs and Matriarchs is located, according to Jewish and Islamic tradition. It was also the capital of the Kingdom of Judah before David moved it to Jerusalem. Jericho – Tourism increased by nearly 42.3% in the first three-quarters of 2008 as crossing between areas under PA control and Israel became less restricted. Qumran – An ancient Jewish site where the Dead Sea Scrolls were discovered. It is administered by the Israel Nature and Parks Authority. Nablus – Also known as Shechem, where Joseph's Tomb and Jacob's Well can be found. The Golan Heights were captured by Israel from Syria in the 1967 Six-Day War and are recognized by the international community as Syrian territory held by Israel under military occupation. In an act ruled null and void by the United Nations Security Council, Israel applied civilian law to the territory in 1981. 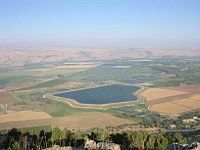 For ease of touring, the Golan can be divided into the north with most of its popular destinations and the south where the administrative capital is located. Travel guides recommend renting a car or joining an organized tour. Although it is slower, some travelers chose to hitchhike throughout the region. Accommodations are typically through bed and breakfasts or cabins called zimmers. The first Israeli ski resort was established in the Golan. Nature trails and other attractions were established by Israel in order to further entrench its presence in the territory and to attract tourists. As much of the Golan's land is not arable, many of the Israeli settlements established focused on tourism as a way of generating income. The Golan has national parks which provide extensive hiking options. Most of these are maintained by the Israel Nature and Parks Authority. Land mines from previous wars pose a risk when clearly marked and fenced off areas are disregarded. The Mount Hermon ski resort is popular during the winter months. This is the first Israeli ski resort in the Golan. The area produces wine and the Golan Heights Winery is a large producer. The winery has a visitor's center and tours. Eilat is located in the Gulf of Aqaba, one of the most popular diving destinations in the world. The coral reefs along Eilat's coast remain relatively pristine and the area is recognized as one of the prime diving locations in the world. About 250,000 dives are performed annually off Eilat's 11 km coastline, and diving represents 10% of the tourism income of this area. In addition, given the proximity of many of these reefs to the shore, non-divers can encounter the Red Sea's reefs with relative ease. Water conditions for SCUBA divers are good all year round, with water temperatures around 21–25 C°, little or no currents and clear waters with an average of 20–30 meters visibility. Israel is emerging as a popular destination for medical tourists. In 2006, 15,000 foreigners travelled to the country for medical procedures, bringing in $40 million of revenue. The advantages of Israel for health tourism include good natural resources; stable, comfortable climate all year round; a progressive medical systems, and scenic locations which have a calming effect on patients. Medical tourists choose Israel for several reasons. Some come from European nations such as Romania where certain procedures are not available. Others come to Israel, most commonly from the United States, because they can receive quality health care at a fraction of the cost it would be at home, for both surgeries and in-vitro fertilization treatments. 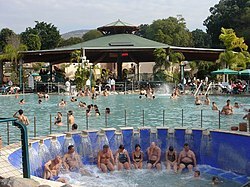 Other medical tourists come to Israel to visit the Dead Sea, a world-famous therapeutic resort. The Israel Ministry of Tourism and several professional medical services providers have set out to generate awareness of Israel's medical capabilities. According to the Israeli Ministry of Tourism, in 2009 54% of the 2.7 million visitors to Israel were Christian. Jewish tourists accounted for 39%. Revenue from tourism in 2009 totalled $3.3 billion. In 2010, tourism constituted 6.4% of the country's GDP. The World Travel and Tourism Council estimates that real GDP growth for tourism in Israel is expected to average 5.0% per annum over the years 2010–2020. The contribution of tourism to Gross Domestic Product is expected by WTTC to rise from 6.4% (US$12.0 billion) in 2010 to 7.2% ($22.1 billion) by 2020. The contribution of the industry to employment is 223,000 jobs in 2010, 7.9% of total employment. Export earnings from international visitors and tourism goods are expected to generate 6.5% of total exports (US$4.8 billion) in 2010. Investment in tourism is estimated at US$2.3 billion or 7.6% of total investment in 2010. The Israel Travel & Tourism economy is ranked number 51 in absolute size worldwide, of the 181 countries estimated by the WTTC. In 2005, Ernst & Young conducted a comprehensive research study on Israeli tourism. The report, entitled "A New Market Strategy for Israeli Tourism" was published in November 2006. The researchers felt that increasing the number of international tourists by 2011 from 1.9 million to 4–5 million was a feasible goal. The report stated that Israel's most attractive feature for international markets was its religious culture and history and the great diversity it offers within a very small country. According to the researchers, Israel's different cultures and religions, its diverse landscapes, the contrasts between cities (Jerusalem, Tel Aviv), and combination of European, North African and Middle Eastern culture produced a "very high density of experience." The report recommended that Israel adopt appropriate marketing strategies to counter any perceived negative imagery associated with political developments. In 2010, Israel won the title of "most outstanding stand" in all categories at the world's largest tourism fair, ITB, held in Berlin. The Israeli stand won the title of "best presenter" in the Near East and Middle East for the third time in a row. In 2009, the two most visited sites in Israel were the Western Wall[neutrality is disputed] and the grave of Rabbi Shimon bar Yochai. 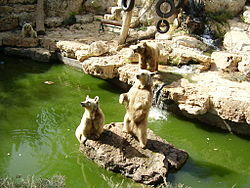 The most popular paid tourist attraction is the Jerusalem Biblical Zoo. The top paid sites of 2012 were listed by Dun & Bradstreet Israel as opposed to the above sites which offer free entry. ^ Jerusalem is the capital under Israeli law. The presidential residence, government offices, supreme court and parliament (Knesset) are located there. The Palestinian Authority foresees East Jerusalem as the capital of its future state. The United Nations and most countries do not recognize Jerusalem as Israel's capital, taking the position that the final status of Jerusalem is pending future negotiations between Israel and the Palestinian Authority. Most countries maintain their embassies in Tel Aviv and its suburbs or suburbs of Jerusalem, such as Mevaseret Zion (see CIA Factbook and this map of Israel (319 KB)) See Positions on Jerusalem for more information. ^ Yan (January 3, 2018). "Israel sees record 3.6 mln inbound tourists in 2017". Xinhua News Agency. ^ Amir, Rebecca Stadlen (January 3, 2018). "Israel sets new record with 3.6 million tourists in 2017". Israel21. ^ Raz-Chaimovich, Michal (December 27, 2017). "Record 3.6m tourists visit Israel in 2017". Globes. ^ "Israel Sees Record 3.6 Million Tourists in 2017". Atlanta Jewish Times. January 4, 2018. Archived from the original on January 11, 2018. 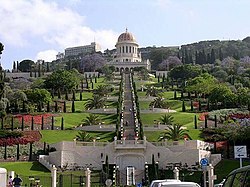 ^ a b "For first time, religious sites to get state budget of NIS 6.3M". HaAretz. Retrieved March 8, 2009. ^ a b "Masada tourists' favorite spot in Israel". Ynetnews. Retrieved April 8, 2009. ^ Bremner, Caroline (January 10, 2011). "Euromonitor International's Top City Destination Ranking". Euromonitor International. Retrieved January 10, 2011. ^ "Ancient Jerusalem's Funerary Customs and Tombs: Part Two, L. Y. Rahmani, The Biblical Archaeologist, Vol. 44, No. 4 (Autumn, 1981), pp. 229–235. ^ Westhead, Rick (December 16, 2012). "Jerusalem's Mount of Olives cemetery running out of room". The Jerusalem Post. Retrieved December 16, 2012. ^ "Tourism in Israel hits all time high". Haaretz. January 10, 2014. Retrieved April 22, 2018. ^ "Israeli ornithologists confirm flight path of migrating cranes". Haaretz. March 4, 2011. ^ Donnison, Jon (December 1, 2010). "Bird watchers find heaven in 'superhighway' Israel". BBC. Retrieved November 23, 2015. ^ "Science & Technology". Consulate General of Israel in Los Angeles. Archived from the original on April 16, 2007. Retrieved May 26, 2007. ^ Hazan, Susan. "The Israel Museum and the Electronic Surrogate". Cultivate Interactive. Archived from the original on July 27, 2008. Retrieved May 6, 2009. ^ a b c Helstosky, Carol (2009). Food Culture in the Mediterranean. Westport, Conn.: Greenwood Press. pp. 124–125. ISBN 978-0-313-34626-2. ^ a b Gur, Jana (2008). The Book of New Israeli Food. New York: Schocken Books. pp. 12, 44, 68, 164, 217. ISBN 978-0-8052-1224-2. ^ Campbell, Dawn (1995). The Tea book. Pelican Publishing Company. p. 142. ISBN 978-1-56554-074-3. ^ Ansky, Sherry; Sheffer, Nelli (2000). The Food of Israel: Authentic Recipes from the Land of Milk and Honey. Hong Kong: Periplus Editions. p. 30. ISBN 978-962-593-268-2. ^ "Israel seeks to become wine tourism destination". Globes. January 17, 2008. Retrieved June 20, 2013. ^ a b Kaufman, David; Katz, Marisa S. (April 16, 2006). "In the West Bank, Politics and Tourism Remain Bound Together Inextricably". The New York Times. Retrieved July 4, 2010. ^ Enz, Cathy A. (2009). Hospitality Strategic Management: Concepts and Cases (2 ed.). John Wiley and Sons. p. 273. ISBN 978-0-470-08359-8. ^ Mitnick, Joshua (December 26, 2008). "Calm brings record tourism to Bethlehem". The Christian Science Monitor. Retrieved July 2, 2010. ^ a b Thomas, Amelia; Kohn, Michael; Raphael, Miriam; Raz, Dan Savery (2010). Israel and the Palestinian Territories. Lonely Planet. ISBN 978-1-74104-456-0. ^ Korman, Sharon. The right of conquest: the acquisition of territory by force in international law and practice Archived June 10, 2016, at the Wayback Machine, Oxford University Press, 1996. pg. 265. ISBN 0198280076. "The continued occupation of the Syrian Golan Heights is recognised by many states as valid and consistent with the provisions of the UN Charter, on a self-defence basis. ...But the notion that Israel is entitled to claim any status other than that of belligerent occupant in the territory which it occupies, or to act beyond the strict bounds laid down by the Fourth Geneva Convention, has been universally rejected by the international community." ^ Jacobs Daniel; Eber, Shirley; Silvani, Francesca (1998). Israel and the Palestinian territories: The Rough Guide. Rough Guide. ISBN 978-1-85828-248-0. ^ a b Kohn, Michael (2007). Israel and the Palestinian Territories. Lonely Planet. ISBN 978-1-86450-277-0. ^ a b Fodor's Israel. Random House, Inc. 2009. ISBN 978-1-4000-0898-8. ^ Artificial Reefs and Dive Tourism in Eilat, Israel Dan Wilhelmsson, Marcus C. Öhman, Henrik Ståhl and Yechiam Shlesinger Ambio, Vol. 27, No. 8, Building Capacity for Coastal Management (Dec. 1998), pp. 764–766 Published by: Allen Press on behalf of Royal Swedish Academy of Sciences Wilhelmsson, Dan; Öhman, Marcus C.; Ståhl, Henrik; Shlesinger, Yechiam (1998). "Artificial Reefs and Dive Tourism in Eilat, Israel". Ambio. 27 (8): 764–766. JSTOR 4314831. ^ a b c Sapir Peretz (March 21, 2013). "גן החיות התנכ"י: שיאן המבקרים בשנת 2012" [Biblical Zoo: Top visited in 2012]. Globes (in Hebrew). pp. 10–11. ^ "VISITOR ARRIVALS(1), BY COUNTRY OF CITIZENSHIP" (PDF). Archived from the original (PDF) on February 13, 2017. Retrieved February 12, 2017. Stein, Rebecca L (2008). "SOUVENIRS OF CONQUEST: ISRAELI OCCUPATIONS AS TOURIST EVENTS". International Journal of Middle East Studies. 40 (4): 647–669. doi:10.1017/S0020743808081531. Hazbun, Waleed (2008). Beaches, ruins, resorts: the politics of tourism in the Arab world. U of Minnesota Press. ISBN 978-0-8166-5492-5. Timothy, Dallen J (2001). Tourism and political boundaries. Routledge. ISBN 978-0-415-19696-3. Efrat, Elisha (1988). Geography and Politics in Israel Since 1967 (1 ed.). Routledge. ISBN 978-0-7146-3303-9. Wikimedia Commons has media related to Tourism in Israel. Wikivoyage has a travel guide for Israel.